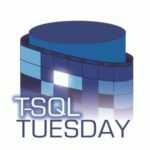 T-SQL Tuesday is a recurring blog series which was launched by Adam Machanic (b | t). Every month, a blogger is hosting a topic around the SQL Server and anyone can write a blog post on this particular topic. This month, Matt Gordon (b | t) our host and the topic is about new features in the SQL Server (starting with the 2014 version) which fixes old issues, see more details in his announcement post. 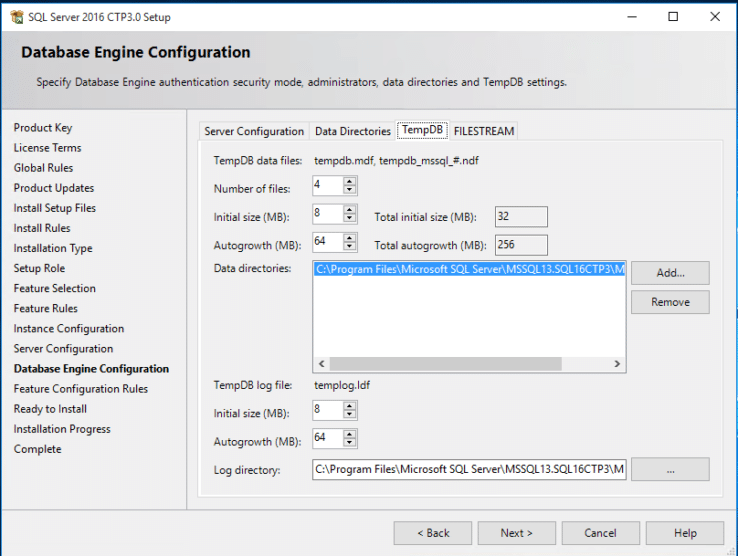 My topic for this TSQL2sDay is the new possibility to configure the TempDB as part of the SQL Server installation. Previously, after you’ve finished a SQL Server installation, you had to implement best practice recommendations from Microsoftthe best practice recommendations from Microsoft in a more or less complicated way. 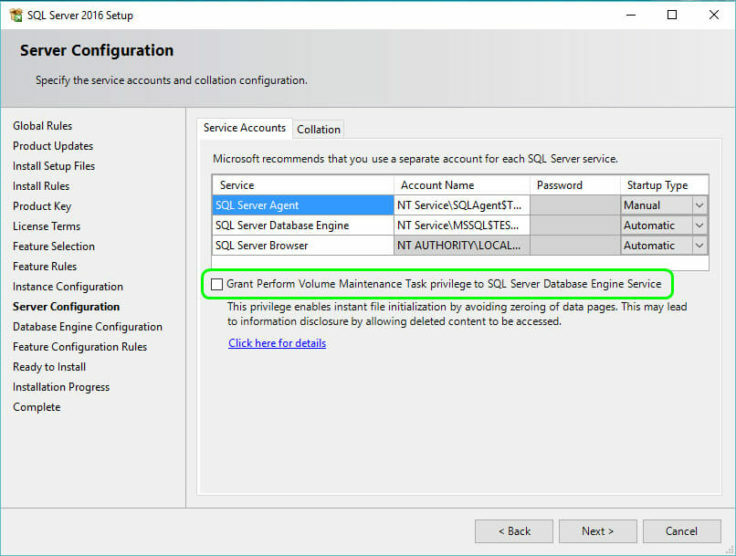 Either you approach the topic in a more conventional way and adjust the values manually via the SQL Server Management Studio or you had made it a little bit easier to automate this by a T-SQL or Powershell script. But still, you had to add these configuration adjustments every time to achieve an optimized TempDB performance. Essentially the TempDB performance comes basically with the hardware configuration, in this case, the physical separation between user databases and TempDB by transferring the TempDB onto a high-performance storage. Microsoft recommends the strict separation of UserDB and TempDB, not only through separate folder structures or separate partitions but should by separated (fast) disks. There is no need for a great RAID configuration, a RAID 1 or RAID 10 would be great, but no real need, because the TempDB is always “re-created” when restarting SQL Server, so it would not be a “drama” when it is corrupt or the discs below would crash. (Ok, here I don’t care about the possible loss of data and time). Once this physical optimization has been implemented in the storage area, you can make the logical adjustments in the configuration. Depending on the processor/core count, Microsoft also recommends splitting data files into several separate files instead of one large data file in order to optimize the performance of the IO streams (parallelization). Likewise, depending on the application or requirements, the data files can initially be set to a fixed size so that the internal structure of the data files are optimized and all files are the same size. (Similar to trace flag 1117/1118). Otherwise, the Autogrowth parameter should be set to 10% so that the data files in conjunction with Trace flags 1117 and 1118 contribute to an optimized, uniform structure of the TempDB. The SQL Server 2016 now brings this whole logical optimization right to the installation process… now you can tell the SQL Server how to set the number and distribution of TempDB data files and their auto growth parameters within the installation steps. Microsoft has finally integrated the long-published Best Practices recommendations into the installation process. So you only have to create the hardware prerequisites for the TempDB and can start to install. Ok, here, too, you have to worry about which values you want to set, but at least you do not have to worry about these configurations afterward! THANKS to Microsoft for this improvement. During the installation process, you can set how many data files you want to create, the initial size and the Autogrowth parameter. Theoretically, you are even able to name a separate path for each individual data file (division by the number of cores) or even a separate (SSD) disc. Everything is displayed on a clear screen and can be used also from an inexperienced DBA. Björn works as a database administrator and Head of Competence for MS SQL and mySQL in Hamburg (Germany). 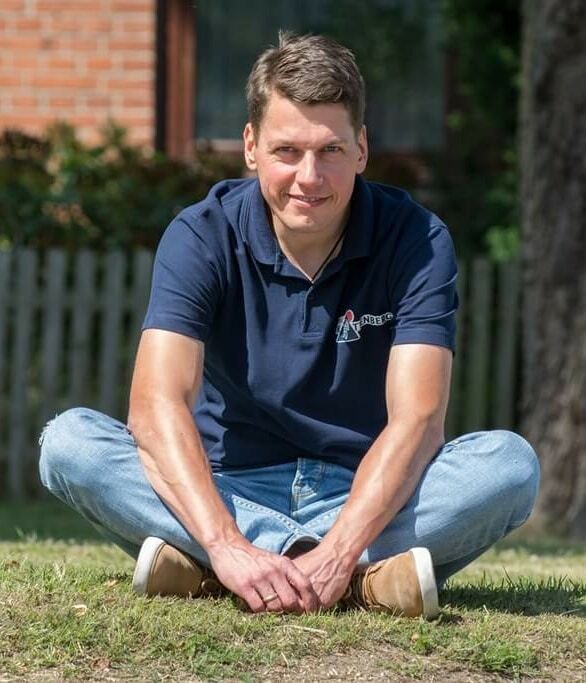 He regularly participates in the PASS regional group meetings, events of the PASS such as SQLSaturday and SQLGrillen and he organizes the Azure Meetup group in Hamburg. He is interested in topics like SQL Server, Powershell and Azure for science fiction, snowboarding, baking and cycling. Now that the SQL Server 2016 officially released, more and more details coming to light, so that you have to get slowly prepared for your first “real” installation. What has changed compared to SQL Server 2014 in part of installing everything? 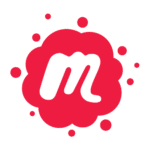 How should we adapt any existing documentation? When reading numerous tweets and blogs I stumbled across a Tweet to SQL Server 2016 by Thomas Larock, he has created a very nice overview of varieties of new features in SQL Server 2016, which can be used e.g. for increasing the performance of SQL Server. Previously you had a variety of parameters and settings to optimize performance before installation (for example, Instant File Initialization) or adjust the number of TempDB files after installation. I would like to respond to the changes in the context of the SQL Server 2016 installation, which I am personally very pleased to facilitate a part of my work. Now during installation, you can simply tick and installation process takes care of the work for you. Many thanks for this to Microsoft! The configuration of the TempDB after the installation always took a little time of course, you could script it so far, but it was never as easy as it was before, it still meant a certain effort. Microsoft has also moved this configuration into the installation process so that you do not have to call another script after the installation. In this new tab under Database Engine Configuration, you can set the number of TempDB files, their initial size and auto-growth value. You can customize the paths of both file types individually, theoretically, you can also specify several paths for the TempDB data files. All these new configuration parameters could be passed to sql server installation via the ConfigurationFile.ini or command line. The above optimization (or better simplifications) makes the installation and performance-oriented configuration of SQL Server much more comfortable. However, it also has a small drawback (*wave*), the DBAs lose some of their influence since now everyone has the opportunity to operate this performance screws. I got in contact with MS SQL databases for the first time in 2000 and took care of these database systems for around 7 years. Since 2007, I have been working as a database administrator and remains responsible for a large number of SQL servers of all sizes of companies from different technology sectors. Actually, I do not have any certificates, my knowledge and knowledge about the SQL Server purely from the daily business, the reading/tracking of numerous forums/blogs. I' m not specialized in any topic really, but put my focus on the performance analysis. Since the end of 2016, I'm the main organizer of the Azure Meetup Hamburg and from April 2017 to June 2018 I was awarded as Cloud and Datacenter Management MVP and since July 2018 I changed the category to Data Platform.